Music Skills: Of course, they begin learning musical skills, such as rhythm, varying tempo and pitch, and how to echo back what they hear. They learn to use their singing voice and play instruments. Auditory Processing: They learn how to listen. Children who have music lessons respond to sounds more quickly, distinguish between sounds, and pay attention to sounds, all of which aids in learning. Language: When listening to and singing songs, there’s lots of language learning. They learn to hear the rhythm of language, the break between syllables and words, hear and predict rhymes, work on pronunciation, and get exposed to a wide ranging vocabulary – from the water spout the spider climbs up to the pockets full of posey and the fleece on Mary’s lamb. Singing the alphabet song and singing about 5 little ducks who went out one day teach letter and number sequences. Vestibular Development: With babies and toddlers, when we hold them in our arms while we dance, or hold them in our laps for lap songs, like the Grand Old Duke of York, all that bouncing up and down, swaying side to side, and even flipping upside down helps to develop their vestibular system – the system that helps them to balance and know their position. Large Motor: When kids dance, clap, swing their arms, roll arms to Wheels on the Bus, shake the shaker or bang the drum, they’re learning large motor movements – new ways of using their bodies. 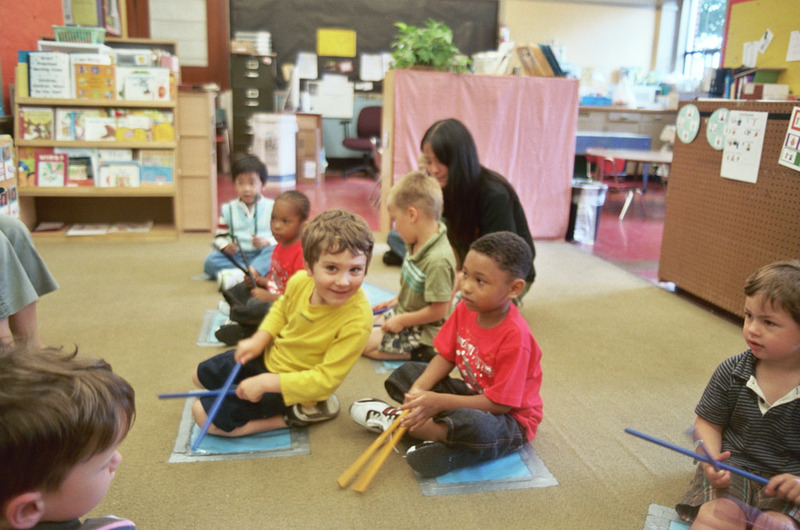 Small motor: As children learn to use more sophisticated instruments, starting with triangles and rhythm sticks, moving up to keyboards, and then stringed instruments or wind instruments, they develop precise fine motor skills. They can then apply these in lots of other areas of life. Steady Beat: By the age of 3 or 4, children should know how to keep a beat, but most do not. Steady beat helps with a huge array of physical tasks which are easier and/or more effective with rhythm: walking, dancing, dribbling a ball, rowing a boat, typing on a keyboard, cutting vegetables, jumping rope, cutting with scissors and much more. Also, research shows kids with the ability to keep a steady beat pay attention for longer periods and do better in school. Keeping Time / Math: Music enhances brain development in areas tied to counting, organization, time, and division of larger notes into smaller notes (i.e. fractions). Impulse Control: When we take our shakers and we “shake and we shake and we shake and we stop”, kids are learning impulse control and following directions. How do we stop doing something when told to stop, and how do we wait till we’re told it’s time to start again? These are key skills for success at school and life. Predicting what comes next / pattern recognition: When you sing the same song to your child over and over, they learn to expect what is coming next… “After mom says ‘with a one step, and a two step’ she’s gong to tickle me!” This helps them learn to understand cause / effect, and routines. Emotional Intelligence: In Brain Rules for Babies, John Medina describes how when a child learns to recognize different musical tones, they also learn to recognize different emotional tones, and can tell more about how others feel. Young babies who were exposed to music classes had improved communication: more likely to point to objects, wave goodbye, smile, and show less distress. Attachment: Music can foster emotional attachment. Even when babies are still in the womb, music can be a way to make a connection – they will respond to your voice. After birth, your family’s songs start becoming familiar and recognizable, and a part of their safe and secure environment. Routines / Transitions: Familiar songs create a sense of comfort for a child. No matter where you are, you always have access to this same familiar tune. Many parents and teachers learn the value of songs for reinforcing routines (“this is the song we always sing at bedtime”) and signaling that it’s time to transition from one activity to the next (the cleanup song!). Memory: Research has shown that children who’ve taken music lessons have a better ability to repeat back and to remember what they hear or read. Teaching information in a song form also makes it easier for kids to remember – make up a little song to help them memorize your phone number! Practice group skills: Sitting at circle time, listening to the teacher, participating when asked, figuring out when they’re supposed to just sit quietly (and learning how to just sit quietly! ), starting an activity when all the other children do and stopping when they do are all important steps in school readiness. IQ and academic success: Research has shown that children who participate in music lessons have higher IQ’s, do better in school, and score better on standardized tests. The more years of music lessons they take, the better they do. Fun: One of the biggest reasons we have music in our classes is because it is fun! Making music with others gives us all joy. The smiles and giggles in music time delight parents, children, and teachers. Jbrary – a YouTube channel featuring children’s librarians singing songs, lap songs, and finger rhymes from library story times: www.youtube.com/user/Jbrary/videos. Nancy Stewart – lyrics and .mp3 audio recordings of lots of traditional songs, including “songs every child should know” http://singwithourkids.com/song-library.htm. Recommended books which include songs, or have rhythmic text that can be sung, to reinforce early literacy skills: http://singwithourkids.com/bookshelf.htm. YouTube has a huge collection of animated videos featuring traditional and new children’s songs, in a wide range of languages. Quality ranges tremendously, and many are inappropriate for children; however, there are some great ones if you search and preview and make your own playlists. If you would like a printable version of this information to hand out, here’s the Music Benefits PDF. This entry was posted in Early Learning / Preschool, For Educators and tagged early learning, kids music, kids songs, nursery rhymes on June 28, 2017 by Janelle Durham.